So i did some work today and washed the car, cut the hood to clear the radiator as I re-secured it and the cap hit it again. Also stripped the entire car of every sticker except the team sticker (Opposite Grip) and my buddy’s shop (www.Renown-Performance.com). I must say, the car looks much classier without all the gaudy stickers, even with destroyed fenders, hah. But as you can see.. the front has about 7 degrees of camber at the moment. I had to raise the car three turns in order to stop rolling rubber off on the metal fenders in half-dollar sized balls (literally), although it still rubs because as it turns out lengthening your control arm also lowers you car. The moment arm is lengthened and therefore your spring is easier to compress due to the steeper angle between the top hat and lower balljoint. This thing was low as crap! I already pulled the fenders a LOT, and need to pull more or man up and actually buy something fiberglass other than sideskirts. 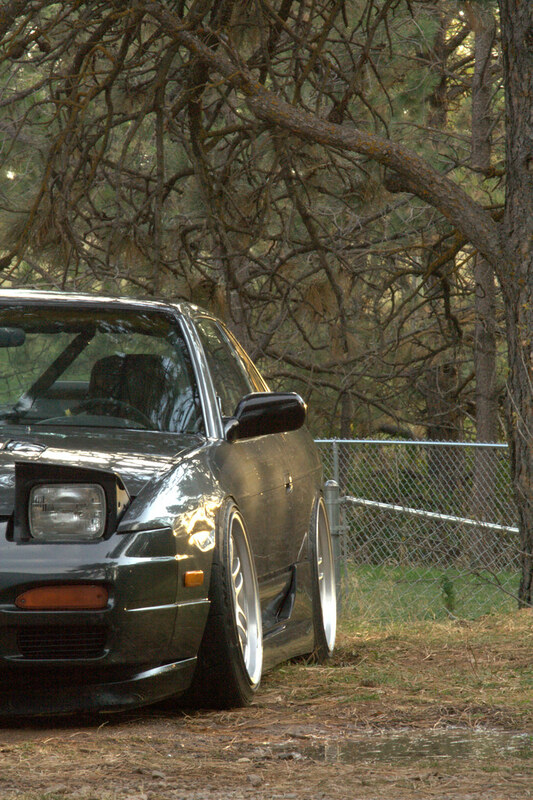 Currently i am stuck at this much camber until i can make the fenders wider. I am aiming for about 5 degrees. Previous PostControl ArmsNext PostFew pics of the car – Door Bar Update.